Metastases and associated complications are the major cause of death for cancer patients. In prostate cancer (PCa), 90% of patients with advanced tumors develop bone metastases (BMs). The reason why bones are frequently affected organs for metastases in PCa has been studied extensively. The activation of osteoclasts is crucial within the process of development of BMs. Preclinical studies have shown that inhibition of osteoclasts helps to prevent bony spread of disease. Seeded tumor cells produce chemokines and promote tumor cell growth. Moreover, they cause stimulation of osteoblast activity resulting in overexpression of the receptor activator of nuclear factor κB ligand (RANKL). RANKL molecules released by osteoblasts and tumor cells lead to an increased maturation and differentiation of osteoclast precursor cells. The activity of these osteoclasts promotes further release of substances which in turn promotes growth of tumor cells, resulting in a vicious cycle of tumor growth and bone destruction., The understanding of this pathophysiologic mechanism resulted in the approval of a new bone-targeting agent, denosumab. Denosumab is a fully humanized antibody targeting RANKL. Median time between clinical diagnosis of BMs and death is 3–5 years., Approximately 3% of patients have BMs at the time of initial diagnosis. In 86% of PCa patients, bones are the only localization of metastatic spread. Patients with a high-risk locally advanced PCa, a predominant Gleason 4 pattern, or a prostate-specific antigen (PSA) >10 ng ml−1 have a higher risk for BMs and therefore should be assessed for BMs at initial diagnosis. [99mTc] (technetium-99m-methylene diphosphonate) bone scan (BS) has been the most widely used method for evaluating BMs in PCa. A PSA doubling time (PSA-DT) of <6 months or a PSA velocity >0.5 ng ml−1 per month are predictors of a positive BS. Symptomatic patients should receive further diagnostic workup focused on BMs, independent of the previously mentioned risk factors. In PCa, BMs are mainly osteoblastic and involve the axial skeleton, the pelvis, and the proximal femur. Extra-axial extension of BMs has been described as a poor prognostic factor., Four or more BMs with at least one metastasis beyond the pelvis and vertebral column (also called appendicular metastases) have been defined as high-volume disease in a recent published study. BMs lead to skeletal-related events (SREs). SREs are defined as pathologic fracture, spinal cord compression, radiation, or surgery to bone. They are linked to pain, immobilization, hospitalisation, reduced quality of life (QoL), and worse survival. Decreased survival is partially caused by the consequences of immobilization. The cumulative incidence of SREs within 2 years after diagnosis of BMs is 41.9%. Reducing the incidence or prolonging the time to occurrence of SREs is important for improving clinical outcomes in patients as well as reducing the financial burden of disease. The term symptomatic skeletal event was introduced in order to take the clinical relevance of a skeletal-related event into account., Beside the structural damage in bone, BMs are often symptomatic and therefore interfere with patients' QoL. The mechanism involved in bone pain due to metastatic spread is poorly understood. One important factor is osteolysis, others include microfractures and stretching of the periosteum by tumor growth. Biochemical mechanisms of pain include the stimulation of nerve endings with mediators such as bradykinin, prostaglandin, histamine, interleukin, and tumor necrosis factor. Pain is an independent prognostic factor in patients with metastatic castration-resistant prostate cancer (mCRPC). Bearing this in mind, patients suffering from symptomatic BMs require optimal management to reach quick and effective symptom control. Treatment decisions must take into account if BMs are uni-, oligo-, or multilocular as well as the presence or absence of extraskeletal disease. The aim of the present review is to summarize the current clinical practice and future trends in the management of patients with BMs. Unfortunately, the radiologic assessment of BMs and their response to treatment is challenging. Today, it is widely accepted to use BS as the standard workup for the evaluation of BMs. [99mTc] BS has shown a combined sensitivity and specificity of 79% and 82% at patient level and 59% and 75% at lesion level, respectively. Within clinical trials, quantitative measure of disease burden, such as lesional number of the BS index or lesion area, is also suggested. A “flare phenomenon” can be seen in BS after 8–12 weeks after induction of a new and effective therapy. Within this flare period also, new bone lesions can be found resulting, for example, in a “melting” of huge bone metastasis into smaller spots, which can be mistaken as new BMs. Retrospectively, this flare is often associated with favorable response in long-term follow-up. In mCRPC, updated in 2016, the Prostate Cancer Clinical Trials Working Group (PCWG) set up special criteria for progression of BMs in clinical trials. The so-called “2 + 2” rule, initially published in 2008, described two new metastatic lesions, supplemented with a confirmatory scan, as progressive disease. Scans should be performed every 8–9 weeks for the first 24 weeks, and then every 12 weeks. Of note, no clear definition of response to therapy in BMs is given. Additionally, magnetic resonance imaging (MRI) should also be used in unclear BS results. Based on morphologic criteria and changes in diffusion coefficient, it is possible to distinguish benign and malignant lesions and detect early signs for response. Currently, whole-body MRI has not been widely adopted in clinical routine in terms of costs as well as patient's comfort, although it was able to show excellent results in terms of detecting BMs. Positron emission tomography (PET), in combination with computed tomography (CT) or MRI, has been used increasingly in the last years. With this technique it is possible to combine biochemical with topographic information. Of note, detection rates of these imaging methods are dependent on PSA values. In [68Ga]-PSMA-PET-CT, detection rates of 58% and 76% have been reported for PSA ranges of 0.2–1 and 1–2 ng ml−1, respectively. Due to its difficulties in interpretation and high costs, choline PET/CT has not made its way into clinical routine although it seems to be more sensitive in the detection of BMs than BS., In contrast, [68Ga]-PSMA-PET has been able to show higher negative predictive value and accuracy for the detection of locoregional recurrence and/or metastatic lesions in the first studies. In comparison to [18F]-Choline-PET-CT, it can detect lesions characteristic for PCa with improved contrast, especially at low PSA levels. Therefore, an increased use of this imaging modality also in patients with metastatic disease is expected. Current therapeutics used for the treatment of BMs in PCa can be divided into bone-targeting agents and systemic therapy, showing unspecific action also being active in bone. [Table 1]summarizes bone-related end points from clinical trials using bone-targeting agents and non-bone-specific drugs in patients with advanced PCa. Zoledronic acid (ZA) has been approved in Europe in 2003 for the prevention of SREs in patients with solid tumors and BMs. As a nitrogenous bisphosphonate, it inhibits the mevalonate pathway leading to the induction of apoptosis in osteoclasts. It is structurally similar to pyrophosphate and binds to hydroxyapatite crystals integrating into the bone matrix. Preclinical studies additionally suggested that ZA might also affect PCa cell adhesion and migration and promote apoptosis through the inhibition of tumor growth. In the Phase III study leading to drug approval, ZA was tested in 641 patients with BMs and CRPC. The comparator was placebo. Treatment was initially planned for 15 months with two dosages of 4 and 8 mg every 3 weeks. Due to several renal events, the 8-mg dosage was reduced to 4 mg. Saad et al. were able to show that men treated with ZA had fewer SREs compared to women (38% vs 49%, P = 0.029). Also, time to occurrence of the first SRE was prolonged. Moreover, fewer pathological fractures in the ZA group were seen compared to placebo group (13.1% vs 22.1%, P = 0.015). During 24 months, 122 patients completed the study treatment. The annual incidence of SREs was 0.77 for patients in the ZA group versus1.47 for patients in the placebo group (P = 0.005). Median time to the first SRE was 488 days for patients treated with ZA compared to 321 days in patients treated with placebo (P = 0.009). Also, a reduction of metastases-related pain was seen. In contrast, no prolongation of progression or OS was measurable. Several trials have assessed whether ZA has a positive effect in earlier stages of PCa. In a Phase III trial called the “Zometa European Study” (ZEUS), patients with localized high-risk PCa were treated with 4 mg ZA every 3 months versus placebo. Here, ZA was ineffective in the prevention of BMs. The ALLIANCE trial investigated ZA versus placebo in patients with hormone-naïve metastatic PCa. Early introduction of ZA was not associated with increased time to the first SRE. The STAMPEDE trial explored the treatment of hormone-naïve metastatic or locally advanced PCa in a multiple-arm design. No clinically and statistically significant improvement in survival was found for adding ZA to standard of care androgen deprivation therapy (ADT). Even the time to the first SRE was not prolonged in the group additionally treated with ZA (hazard ratio [HR]: 0.89, P = 0.221). Side effects of ZA are usually Grade I–II, but also serious complications can occur in 2% of patients, including acute systemic inflammatory reaction, ocular inflammation, renal failure and nephrotic syndrome, osteonecrosis of the jaw (ONJ) as well as electrolytic imbalances, mainly hypocalcemia and hypophosphatemia. Typically occurring within 48 h of infusion, fever can be seen in 21% of patients as a sign of an acute-phase reaction. This kind of adverse event is often connected with myalgia (25%) as well as pain (12%) in spines, ribs, and lower limbs, not necessarily at the side of metastases. Pain is usually self-limiting or can be managed by nonsteroidal anti-inflammatory drugs. In case of renal impairment, it is important to adapt the dose of ZA to renal function to prevent renal failure. Radium-223 dichloride ([223Ra]; Xofigo®, Bayer, Leverkusen, Germany) has been approved for the treatment of patients with BMs in mCRPC since 2013. As an alpha-emitting compound, the agent produces a high-energy output over a short range (<0.1 mm or 2–10 tumor cell diameters), facilitating selective destruction of tissue within the bone in the region of osteoblastic lesions while sparing the surrounding normal tissue. The alpha emitter induces mainly double-strand DNA breaks that result in a potent and highly localized cytotoxic effect. [223Ra] shows calcium mimetic properties and therefore accumulates in bone areas with an increased turnover. Similar to previously used radiopharmaceuticals, [223Ra] can reduce pain in a palliative setting in patients with M1b CRPC but without visceral disease. The ALSYMPCA trial compared six injections of [223Ra] (at a dose of 50 kBq per kg body weight intravenously) to placebo in patients being previously treated or unfit for taxane-based chemotherapy. [223Ra] improved OS (14 vs 11.2 months, HR: 0.70) with a 30% reduction of the risk of death for treatment with [223Ra], irrespective of pretreatment with taxane-based chemotherapy. Time to the first SRE was also statistically significant prolonged in favor of [223Ra] with a median of 15.6 and 9.8 months (P < 0.001) for the first and concomitant SRE, respectively. Also, time to SSE could be improved. Symptomatic pathological fracture occurred in 6% patients, spinal cord compression in 5%, and tumor-related orthopedic surgical intervention in 2%, but 32% patients needed radiation to bone. Mainly reported side effects were of gastrointestinal due to the intestinal route of excretion. Nausea was present in 36% patients, diarrhea in 25% as well as fatigue in 26%, loss of weight in 12%, and peripheral edema in 13%. Also, a flare phenomenon has been described in 50% of patients, presenting as pain and/or changes in BSs within the first 3 months under treatment. Bone marrow suppression leads to anemia, which could be observed in up to 31% as well as thrombocytopenia (12%) and neutropenia (5%). The mode of action suggests that combination of treatment regimens including [223Ra] can improve therapeutic effects. Former combinations with radiopharmaceuticals have shown clinical advantages, especially in terms of pain response. Studies are currently investigating the combination of [223Ra] and hormonal therapy (NCT02194842, NCT02225704) as well as reduced docetaxel regimen in addition to [223Ra] (NCT01106352). The effect of vitamin D and calcium supplementation and denosumab on the activity of [223Ra] has been discussed critically, as [223R]a as a calcium analogon is dependant on bone turnover. Concerns that denosumab or ZA may decrease the effectiveness of [223Ra] were counteracted by a subgroup analysis of the ALSYMPCA results, showing that the time to symptomatic SREs was longer in patients receiving bone-targeting agents as well as [223Ra] compared to patients without antiresorptive drugs. Other radiopharmaceuticals such as [153Sm] and [89Sr] are mainly beta-emitters, while [153Sm] also emits a small proportion of gamma radiation. These agents have a relatively far-reaching tissue penetration (0.6–3.1 mm) and low linear energy transfer, which results in a more pronounced bone marrow toxicity. After intravenous injection, the uptake in metastases is 5–10 times higher compared to healthy bone. Leukocyte and platelet nadirs generally occur between weeks 3–6, in more than 50% of patients, with slow recovery after 8–12 weeks. Repetitive re-treatments as well as therapy pauses can be necessary due to upcoming adverse events, which should be taken into account even for subsequent therapies. [153Sm] and [89Sr] can reduce pain within 1–4 weeks and up to 18 months. No Phase III data exist if these beta emitters can have a positive influence on SREs. Their use in routine practice is therefore limited and, in terms of [89Sr], it is widely regarded as being obsolete. Nevertheless, [89Sr] and [153Sm] are approved in the USA and Europe for palliative indications. Abiraterone acetate is a selective inhibitor of androgen biosynthesis that potently and irreversibly blocks CYP17 (also called steroid 17α-monooxygenase, 17α-hydroxylase, 17,20-lyase, or 17,20 desmolase), a crucial enzyme in testosterone and estrogen synthesis, resulting in virtually undetectable serum and intratumoral androgens and antitumor activity in patients with mCRPC. Abiraterone was initially approved in the postdocetaxel setting, demonstrating benefit in OS compared to placebo in the COU-AA-301 trial. Ninety percent of patients in this trial had BMs. As an exploratory end point, time to the first skeletal event (9.9 vs 4.9 months, P = 0.0001) was improved in the abiraterone group. Patients treated with abiraterone had also reduced pain levels in comparison to baseline., More recently, a second Phase III study (COU-AA-302) has led to a further approval in the treatment of chemotherapy-naïve patients. Abiraterone showed superiority over prednisone alone with respect to time to opiate use for cancer-related pain and longer time to decline in performance status. The median time to increase in pain was 26.7 months among patients receiving abiraterone and 18.4 months undergoing treatment with prednisone alone (HR: 0.82; 95% confidence interval [CI]: 0.67–1.00; P = 0.049). A post hoc analysis from COU-AA-302 demonstrated that, in patients with BMs at baseline, treatment with bone-targeting agents in combination with abiraterone was associated with improved outcome, including OS (HR: 0.754, P = 0.012; risk reduction: 25%), time to opiate use (HR: 0.801, P = 0.036; risk reduction: 20%), and time to ECOG deterioration (HR: 0.750, P < 0.001; risk reduction: 25%) compared to no use of bone-targeting agents. In contrast, the use of bone-targeting agents was not associated with significantly longer time to induction of chemotherapy or to PSA progression. Besides these results, abiraterone has been approved and recommended for asymptomatic-to-mild symptomatic patients. Enzalutamide is a compound targeting the androgen receptor (AR), competitively binding to the ligand-binding domain of the AR and inhibiting AR translocation to the cell nucleus. Enzalutamide has been initially approved in the postchemotherapy setting based on the results of the AFFIRM trial. The PREVAIL study demonstrated that the agent can prolong OS in the predocetaxel setting. In both trials, a delay in the time to first SRE (P < 0.001) could be shown (AFFIRM: time to the first SRE 16.7 vs 13.3 months; PREVAIL: time to first SRE 31.1 vs 31.3). In the PREVAIL dataset, 32% of patients undergoing enzalutamide treatment experienced a SRE (37% in the placebo group; HR: 0.72; P < 0.001). Docetaxelhas been approved for the treatment of mCRPC showing OS advantage compared to mitoxantrone and estramustine phosphate., No significant differences in pain relief were found in pivotal SWOG 99-16. Grade 3 pain was more frequently reported in the docetaxel group (34 vs 18). In TAX 327, secondary end points were predefined reductions in pain and an improvement in the quality of life. Forty-five percent of patients throughout the trial presented with pain at baseline. Improvement of pain was seen in 35% (P = 0.01) of patients treated with docetaxel every 3 weeks and 31% (P = 0.08) in the weekly regimen. Twenty-two percent (P = 0.009) of patients reported better QoL within the application every 3 weeks and 23% (P = 0.005) in the weekly regimen. In the ASCENT study, docetaxel in combination with high-dose Vitamin D was used in mCRPC patients and showed a trend toward increased SRE-free survival (planned secondary end point). Time to SRE and SSE was not assessed as an exploratory end point in the most recent studies of docetaxel. Early introduction of docetaxel in patients with hormone-naïve, high-volume disease in combination with ADT was shown to be beneficial in the CHAARTED trial, showing a 17-month OS benefit when adding six cycles of docetaxel to ADT (HR: 0.62; P = 0.0012). Criteria for high-volume disease included the presence of more than four BMs, including one appendicular metastasis, underlining the importance of wide bony spread as a poor prognostic factor. Also, the STAMPEDE trial showed significant improvement in OS with the addition of docetaxel to hormonal therapy in men with CRPC, irrespective of any risk groups. Therefore, chemohormonal therapy or docetaxel “upfront” should be considered as a new standard for men presenting with metastases at the first diagnosis. Cabazitaxel, a taxane structurally similar to docetaxel, was tested versus mitoxantrone in patients with relapse after docetaxel. The TROPIC study demonstrated OS benefit in favor of cabazitaxel, with a median of 15.1 versus 12.7 months and a 30% relative risk reduction of death (HR: 0.70; 95% CI: 0.59–0.83; P < 0.0001). Pain response rates were similar in both groups. Also, no significant difference in time to pain progression was reported. Similar proportions of patients in each group had either reduction or increase in pain. In the updated TROPIC data, average daily pain performance index was lower for cabazitaxel versus mitoxantrone (all cycles; P = 0.035), and analgesic scores were similar. The TROPIC study did not include SREs as a relevant end point. ADT is the backbone in the treatment of advanced PCa. ADT has significant side effects (e.g., cardiovascular disease and diabetes). It is undoubted that long-term ADT also mediates bone loss. These changes in bone structure have an important impact, because osteoporosis can lead to factures, pain, and reduction in QoL. ADT has been shown to prolong time to symptomatic disease and progression-free survival. Therefore, ADT is recommended in the metastatic setting as first-line treatment - independent of localization of metastases. Contemporary data of patients (a subset of the STAMPEDE trial, the control group) undergoing standard of care ADT refresh the knowledge in outcome of patients with BMs undergoing only ADT. Presence of BMs was associated with lower 2-year OS compared to men with soft-tissue metastases, from 85% to 60% (HR: 3.42), and the presence of BMs (regardless of visceral spread) was shown to be associated with worse failure-free survival (FFS) and OS in multivariate analysis. Wong et al. also studied the impact of SRE on survival in patients with metastatic PCa undergoing ADT. In this retrospective cohort, 43.7% patients developed SRE. Median OS as well as cancer-specific survival (CSS) in patients with SREs was shorter compared to patients without SREs (23 vs 48 months, P = 0.003, and 26 vs 97 months, P < 0.001). Multivariate analysis showed that a SRE had significant influence on both OS and CSS with HRs of 2.73 (P = 0.002) and 3.92 (P < 0.001), respectively. The authors concluded that the presence of SRE is an independent poor prognostic factor for patients undergoing ADT. External beam radiotherapy (EBRT) is effective for palliation of BMs. A variety of doses and fractionation schedules were described, but of note that rates of response, pathological fracture, and spinal cord compression are similar, relatively independent of the regimen. Besides pain, the risk for pathological fracture and neurological complications such as spinal cord compression, nerve root pain, or cranial involvement are indications for radiation. Fifty percent to 80% of patients experience improvement in pain and 20%–50% of the treated patients have complete pain relief. Onset of effect occurs generally very rapidly showing benefit within 1–2 weeks. Pain reduction lasts in at least 50% of patients for more than 6 months. Current evidence indicates that single-fraction radiotherapy (with at least 6 Gy) is the treatment of choice for quick pain relief. However, fractionated radiation leads to more effective remineralization of bone. Re-irradiation of painful BMs is also possible with similar effectiveness, whether initial treatment has been single or in multiple fractions. A newer indication for radiation is the so-called metastasis-directed therapy (MDT). This term describes an early palliative approach in oligometastatic cases, including radiation attempting to decrease local complications and delay time to systemic treatment. First studies were able to show that modern radiation can achieve this goal. Moreover, it is still important to offer palliative surgery, which can be effective for managing osteoblastic metastases. Cementation can be a good treatment for painful spinal fracture, improving pain and QoL. In cases of spinal cord compression, immediate surgery (as decompression) is needed. Postoperative radiation can increase the success of surgery in terms of needed re-operations. Postoperative radiotherapy is associated with a higher probability of normal extremity use compared with surgery alone. Recently, image-guided single-fraction robotic stereotactic radiosurgery (CyberKnife®) and stereotactic body radiotherapy have been discussed as potential options in patients with oligometastatic disease and BMs. To date, few series including a limited number of patients indicate promising local control rates. A study including 51 patients treated either by CyberKnife® or stereotactic ablative radiation therapy showed 2-year local control rates of 70%. Moreover, a positive effect on pain control was observed. In a multi-institutional analysis including 119 patients treated by stereotactic body radiotherapy, the median distant PFS was 21 months. A study from Munich including 54 patients with 64 BMs treated with CyberKnife® showed local control rate of 95.5%. Although these data are promising, clinical factors determining the optimal patient for this therapeutic approach remain to be defined before implementing this method in routine clinical practice. BMs require particular attention in the management of patients with advanced PCa. Fortunately, both bone-targeted agents and second-generation antihormonal drugs are able to positively affect the incidence of skeletal complications in mCRPC. The role of bone-targeted agents in metastatic castration-sensitive PCa is still discussed controversially and no clear benefit has been shown so far. Future studies will have to assess whether local treatment of BMs in patients with oligometastatic disease by stereotactic radiation or radiosurgery improves oncologic outcome of these patients. MH, MM, SR, JB, SW, AS, and TT contributed to data acquisition. MH, AS, and TT were responsible for the draft of the manuscript. MM, SR, SW, and JB contributed to review of the manuscript. All authors read and approved the final manuscript. Arnulf Stenzl and Tilman Todenhöfer have served as consultants for Amgen and Astellas. Tilman Todenhöfer has received research funds from Astellas. Bubendorf L, Schöpfer A, Wagner U, Sauter G, Moch H, et al. Metastatic patterns of prostate cancer: an autopsy study of 1,589 patients. Hum Pathol 2000; 31: 578–83. Schneider A, Kalikin LM, Mattos AC, Keller ET, Allen MJ, et al. Bone Turnover mediates preferential localization of prostate cancer in the skeleton. Endocrinology 2005; 146: 1727–36. Zhang J, Dai J, Qi Y, Lin DL, Smith P, et al. Osteoprotegerin inhibits prostate cancer-induced osteoclastogenesis and prevents prostate tumor growth in the bone. J Clin Invest 2001; 107: 1235–44. Boyle WJ, Simonet WS, Lacey DL. Osteoclast differentiation and activation. Nature 2003; 423: 337–42. Ibrahim T, Flamini E, Mercatali L, Sacanna E, Serra P, et al. Pathogenesis of osteoblastic bone metastases from prostate cancer. Cancer 2010; 116: 1406–18. Pound CR, Partin AW, Eisenberger MA, Chan DW, Pearson JD, et al. Natural history of progression after PSA elevation following radical prostatectomy. JAMA 1999; 281: 1591–7. James ND, Sydes MR, Clarke NW, Mason MD, Dearnaley DP, et al. Addition of docetaxel, zoledronic acid, or both to first-line long-term hormone therapy in prostate cancer (STAMPEDE): survival results from an adaptive, multiarm, multistage, platform randomised controlled trial. Lancet 2016; 387: 1163–77. Nørgaard M, Jensen AØ, Jacobsen JB, Cetin K, Fryzek JP, et al. Skeletal related events, bone metastasis and survival of prostate cancer: a population based cohort study in Denmark (1999 to 2007). J Urol 2010; 184: 162–7. Hess KR, Varadhachary GR, Taylor SH, Wei W, Raber MN, et al. Metastatic patterns in adenocarcinoma. Cancer 2006; 106: 1624–33. Briganti A, Passoni N, Ferrari M, Capitanio U, Suardi N, et al. When to perform bone scan in patients with newly diagnosed prostate cancer: external validation of the currently available guidelines and proposal of a novel risk stratification tool. Eur Urol 2010; 57: 551–8. Abuzallouf S, Dayes I, Lukka H. Baseline staging of newly diagnosed prostate cancer: a summary of the literature. J Urol 2004; 171: 2122–7. Wang CY, Wu GY, Shen MJ, Cui KW, Shen Y. Comparison of distribution characteristics of metastatic bone lesions between breast and prostate carcinomas. Oncol Lett 2013; 5: 391–7. Glass TR, Tangen CM, Crawford ED, Thompson I. Metastatic carcinoma of the prostate: identifying prognostic groups using recursive partitioning. J Urol 2003; 169: 164–9. Sweeney CJ, Chen YH, Carducci M, Liu G, Jarrard DF, et al. Chemohormonal therapy in metastatic hormone-sensitive prostate cancer. N Engl J Med 2015; 373: 737–46. Saad F, Gleason DM, Murray R, Tchekmedyian S, Venner P, et al. A randomized, placebo-controlled trial of zoledronic acid in patients with hormone-refractory metastatic prostate carcinoma. J Natl Cancer Inst 2002; 94: 1458–68. Weinfurt KP, Li Y, Castel LD, Saad F, Timbie JW, et al. The significance of skeletal-related events for the health-related quality of life of patients with metastatic prostate cancer. Ann Oncol 2005; 16: 579–84. Oster G, Lamerato L, Glass AG, Richert-Boe KE, Lopez A, et al. Natural history of skeletal-related events in patients with breast, lung, or prostate cancer and metastases to bone: a 15-year study in two large US health systems. Support Care Cancer 2013; 21: 3279–86. Pereira J, Body JJ, Gunther O, Sleeboom H, Hechmati G, et al. Cost of skeletal complications from bone metastases in six European countries. J Med Econ 2016; 19: 611–8. Scher HI, Morris MJ, Stadler WM, Higano C, Basch E, et al. Trial design and objectives for castration-resistant prostate cancer: updated recommendations from the prostate cancer clinical trials working group 3. J Clin Oncol 2016; 34: 1402–18. Parker C, Nilsson S, Heinrich D, Helle SI, O'Sullivan JM, et al. Alpha emitter radium-223 and survival in metastatic prostate cancer. N Engl J Med 2013; 369: 213–23. Muralidharan A, Smith MT. Pathobiology and management of prostate cancer-induced bone pain: recent insights and future treatments. 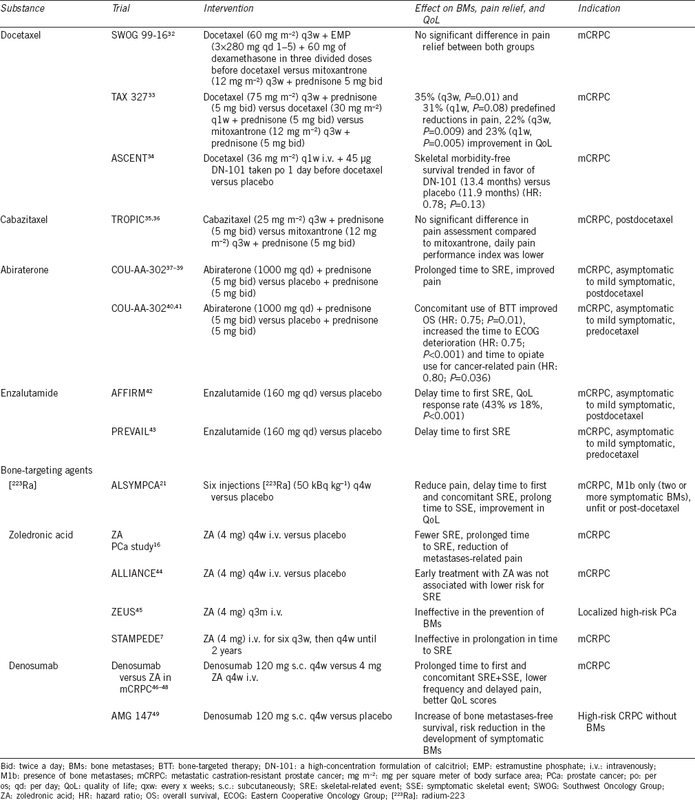 Inflammopharmacology 2013; 21: 339–63. Harrison, George D, Wong, Armstrong A. Radium-223 chloride: a potential new treatment for castration-resistant prostate cancer patients with metastatic bone disease. Cancer Manag Res 2013; 5: 1–14. Shen G, Deng H, Hu S, Jia Z. Comparison of choline-PET/CT, MRI, SPECT, and bone scintigraphy in the diagnosis of bone metastases in patients with prostate cancer: a meta-analysis. Skeletal Radiol 2014; 43: 1503–13. Ulmert D, Kaboteh R, Fox JJ, Savage C, Evans MJ, et al. A novel automated platform for quantifying the extent of skeletal tumour involvement in prostate cancer patients using the bone scan index. Eur Urol 2012; 62: 78–84. Scher HI, Halabi S, Tannock I, Morris M, Sternberg CN, et al. Design and end points of clinical trials for patients with progressive prostate cancer and castrate levels of testosterone: recommendations of the prostate cancer clinical trials working group. J Clin Oncol 2008; 26: 1148–59. Lecouvet FE, El Mouedden J, Collette L, Coche E, Danse E, et al. Can whole-body magnetic resonance imaging with diffusion-weighted imaging replace Tc 99m bone scanning and computed tomography for single-step detection of metastases in patients with high-risk prostate cancer? Eur Urol 2012; 62: 68–75. Brogsitter C, Zöphel K, Kotzerke J. 18F-Choline, 11C-choline and 11C-acetate PET/CT: comparative analysis for imaging prostate cancer patients. Eur J Nucl Med Mol Imaging 2013; 40 Suppl 1: S18–27. Beer AJ, Eiber M, Souvatzoglou M, Schwaiger M, Krause BJ. Radionuclide and hybrid imaging of recurrent prostate cancer. Lancet Oncol 2011; 12: 181–91. Pfister D, Porres D, Heidenreich A, Heidegger I, Knuechel R, et al. Detection of recurrent prostate cancer lesions before salvage lymphadenectomy is more accurate with (68)Ga-PSMA-HBED-CC than with (18)F-Fluoroethylcholine PET/CT. Eur J Nucl Med Mol Imaging 2016; 43: 1410–7. Afshar-Oromieh A, Zechmann CM, Malcher A, Eder M, Eisenhut M, et al. Comparison of PET imaging with a (68)Ga-labelled PSMA ligand and (18)F-choline-based PET/CT for the diagnosis of recurrent prostate cancer. Eur J Nucl Med Mol Imaging 2014; 41: 11–20. Petrylak DP, Tangen CM, Hussain MH, Lara PN Jr., Jones JA, et al. Docetaxel and estramustine compared with mitoxantrone and prednisone for advanced refractory prostate cancer. N Engl J Med 2004; 351: 1513–20. Tannock IF, de Wit R, Berry WR, Horti J, Pluzanska A, et al. Docetaxel plus prednisone or mitoxantrone plus prednisone for advanced prostate cancer. N Engl J Med 2004; 351: 1502–12. Beer TM, Ryan CW, Venner PM, Petrylak DP, Chatta GS, et al. Double-blinded randomized study of high-dose calcitriol plus docetaxel compared with placebo plus docetaxel in androgen-independent prostate cancer: a report from the ASCENT Investigators. J Clin Oncol 2007; 25: 669–74. Bono de JS, Oudard S, Ozguroglu M, Hansen S, Machiels JP, et al. Prednisone plus cabazitaxel or mitoxantrone for metastatic castration-resistant prostate cancer progressing after docetaxel treatment: a randomised open-label trial. Lancet 2010; 376: 1147–54. Bahl A, Oudard S, Tombal B, Özgüroĝlu M, Hansen S, et al. Impact of cabazitaxel on 2-year survival and palliation of tumour-related pain in men with metastatic castration-resistant prostate cancer treated in the TROPIC trial. Ann Oncol 2013; 24: 2402–8. Fizazi K, Scher HI, Molina A, Logothetis CJ, Chi KN, et al. Abiraterone acetate for treatment of metastatic castration-resistant prostate cancer: final overall survival analysis of the COU-AA-301 randomised, double-blind, placebo-controlled phase 3 study. Lancet Oncol 2012; 13: 983–92. De Bono JS, Logothetis CJ, Molina A, Fizazi K, North S, et al. Abiraterone and increased survival in metastatic prostate cancer. N Engl J Med 2011; 364: 1995–2005. Logothetis CJ, Basch E, Molina A, Fizazi K, North SA, et al. Effect of abiraterone acetate and prednisone compared with placebo and prednisone on pain control and skeletal-related events in patients with metastatic castration-resistant prostate cancer: exploratory analysis of data from the COU-AA-301 randomised trial. Lancet Oncol 2012; 13: 1210–7. Ryan CJ, Smith MR, de Bono JS, Molina A, Logothetis CJ, et al. Abiraterone in metastatic prostate cancer without previous chemotherapy. N Engl J Med 2013; 368: 138–48. Saad F, Shore N, Van Poppel H, Rathkopf DE, Smith MR, et al. Impact of bone-targeted therapies in chemotherapy-naïve metastatic castration-resistant prostate cancer patients treated with abiraterone acetate: post hoc analysis of study COU-AA-302. Eur Urol 2015; 68: 570–7. Scher HI, Fizazi K, Saad F, Taplin ME, Sternberg CN, et al. Increased survival with enzalutamide in prostate cancer after chemotherapy. N Engl J Med 2012; 367: 1187–97. Beer TM, Armstrong AJ, Rathkopf DE, Loriot Y, Sternberg CN, et al. Enzalutamide in metastatic prostate cancer before chemotherapy. N Engl J Med 2014; 371: 424–33. Smith MR, Halabi S, Ryan CJ, Hussain A, Vogelzang N, et al. Randomized controlled trial of early zoledronic acid in men with castration-sensitive prostate cancer and bone metastases: results of CALGB 90202 (alliance). J Clin Oncol 2014; 32: 1143–50. Wirth M, Tammela T, Cicalese V, Gomez Veiga F, Delaere K, et al. Prevention of bone metastases in patients with high-risk nonmetastatic prostate cancer treated with zoledronic acid: efficacy and safety results of the Zometa European Study (ZEUS). Eur Urol 2015; 67: 482–91. Fizazi K, Carducci M, Smith M, Damião R, Brown J, et al. Denosumab versus zoledronic acid for treatment of bone metastases in men with castration-resistant prostate cancer: a randomised, double-blind study. Lancet 2011; 377: 813–22. Brown JE, Cleeland CS, Fallowfield LJ, Patrick DL, Fizazi K, et al. Pain outcomes in patients with bone metastases from castrate-resistant prostate cancer: results form a phase 3 trial of denosumab vs. zoledronic acid. Eur Urol Suppl 2011; 10: 336. Patrick D, Cleeland CS, Fallowfield LJ, Smith MR, Klotz R, et al. Denosumab or zoledronic acid (ZA) therapy on pain interference and cancer-specific quality of life (CSQoL) in patients with castrate-resistant prostate cancer (CRPCa) and bone metastases (BM). J Clin Oncol 2014; 32: 366. Smith MR, Saad F, Coleman R, Shore N, Fizazi K, et al. Denosumab and bone-metastasis-free survival in men with castration-resistant prostate cancer: results of a phase 3, randomised, placebo-controlled trial. Lancet 2012; 379: 39–46. Prentice A. Diet, nutrition and the prevention of osteoporosis. Public Health Nutr 2004; 7: 227–43. Saad F, Gleason DM, Murray R, Tchekmedyian S, Venner P, et al. Long-term efficacy of zoledronic acid for the prevention of skeletal complications in patients with metastatic hormone-refractory prostate cancer. J Natl Cancer Inst 2004; 96: 879–82. Tanvetyanon T, Stiff PJ. Management of the adverse effects associated with intravenous bisphosphonates. Ann Oncol 2006; 17: 897–907. Miller K, Fizazi K, Smith M, Moroto JP, Klotz L, et al. Benefit of denosumab therapy in patients with bone metastases from castrate resistant prostate cancer: a number-needed-to-treat (NNT) analysis. J Urol 2011; 185: e262. Smith MR, Coleman RE, Klotz L, Pittman K, Milecki P, et al. Denosumab for the prevention of skeletal complications in metastatic castration-resistant prostate cancer: comparison of skeletal-related events and symptomatic skeletal events. Ann Oncol 2015; 26: 368–74. Body JJ, Lipton A, Gralow J, Steger GG, Gao G, et al. Effects of denosumab in patients with bone metastases with and without previous bisphosphonate exposure. J Bone Miner Res 2010; 25: 440–6. Body JJ, Bone HG, de Boer RH, Stopeck A, Van Poznak C, et al. Hypocalcaemia in patients with metastatic bone disease treated with denosumab. Eur J Cancer 2015; 51: 1812–21. Stopeck AT, Lipton A, Body JJ, Steger GG, Tonkin K, et al. Denosumab compared with zoledronic acid for the treatment of bone metastases in patients with advanced breast cancer: a randomized, double-blind study. J Clin Oncol 2010; 28: 5132–9. Boquete-Castro A, Gómez-Moreno G, Calvo-Guirado JL, Aguilar-Salvatierra A, Delgado-Ruiz RA. Denosumab and osteonecrosis of the jaw. A systematic analysis of events reported in clinical trials. Clin Oral Implants Res 2016; 27: 367–75. Coleman R, Body JJ, Aapro M, Hadji P, Herrstedt J, et al. Bone health in cancer patients: ESMO Clinical Practice Guidelines. Ann Oncol 2014; 25: iii124–37. Cornford P, Bellmunt J, Bolla M, Briers E, De Santis M, et al. EAU-ESTRO-SIOG guidelines on prostate cancer. Part II: treatment of relapsing, metastatic, and castration-resistant prostate cancer. Eur Urol 2017; 71: 630–42. Rubini G, Nicoletti A, Rubini D, Asabella AN. Radiometabolic treatment of bone-metastasizing cancer: from 186rhenium to 223radium. Cancer Biother Radiopharm 2013; 29: 1–11. Coleman R, Fosså S, Chodacki A, Wedel S, Bruland Ø, et al. Time to first symptomatic skeletal event (SSE) with radium-223 dichloride (Radium-223) in patients with castration-resistant prostate cancer (CRPC) and bone metastases: ALSYMPCaA trial stratification factors analysis. Eur J Cancer 2013; 49: S688. Finlay IG, Mason MD, Shelley M. Radioisotopes for the palliation of metastatic bone cancer: a systematic review. Lancet Oncol 2005; 6: 392–400. Pagliarulo V, Bracarda S, Eisenberger MA, Mottet N, Schröder FH, et al. Contemporary role of androgen deprivation therapy for prostate cancer. Eur Urol 2012; 61: 11–25. James ND, Spears MR, Clarke NW, Dearnaley DP, De Bono JS, et al. Survival with newly diagnosed metastatic prostate cancer in the “docetaxel era”: data from 917 patients in the control arm of the STAMPEDE trial (MRC PR08, CRUK/06/019). Eur Urol 2015; 67: 1028–38. Wong K, Ma W, Wong C, Wong M, Tsang C, et al. Impact of skeletal-related events on survival in patients with metastatic prostate cancer prescribed androgen deprivation therapy. Hong Kong Med J 2016; 22: 106–15. Rose JN, Crook JM. The role of radiation therapy in the treatment of metastatic castrate-resistant prostate cancer. Ther Adv Urol 2015; 7: 135–45. Falkmer U, Järhult J, Wersäll P, Cavallin-Ståhl E. A systematic overview of radiation therapy effects in skeletal metastases. Acta Oncol Stockh Swed 2003; 42: 620–33. Lutz S, Chow E. A review of recently published radiotherapy treatment guidelines for bone metastases: contrasts or convergence? J Bone Oncol 2012; 1: 18–23. Ost P, Bossi A, Decaestecker K, De Meerleer G, Giannarini G, et al. Metastasis-directed therapy of regional and distant recurrences after curative treatment of prostate cancer: a systematic review of the literature. Eur Urol 2015; 67: 852–63. Decaestecker K, De Meerleer G, Ameye F, Fonteyne V, Lambert B, et al. Surveillance or metastasis-directed therapy for oligometastatic prostate cancer recurrence (STOMP): study protocol for a randomized phase II trial. BMC Cancer 2014; 14: 671. Dutka J, Sosin P. Time of survival and quality of life of the patients operatively treated due to pathological fractures due to bone metastases. Ortop Traumatol Rehabil 2003; 5: 276–83. Frankel BM, Monroe T, Wang C. Percutaneous vertebral augmentation: an elevation in adjacent-level fracture risk in kyphoplasty as compared with vertebroplasty. Spine J 2007; 7: 575–82. Napieralska A, Miszczyk L, Stapor-Fudzinska M. CyberKnife stereotactic radiosurgery and stereotactic ablative radiation therapy of patients with prostate cancer bone metastases. Neoplasma 2016; 63: 304–12. Ost P, Jereczek-Fossa BA, As NV, Zilli T, Muacevic A, et al. Progression-free survival following stereotactic body radiotherapy for oligometastatic prostate cancer treatment-naive recurrence: a multi-institutional analysis. Eur Urol 2016; 69: 9–12. Muacevic A, Kufeld M, Rist C, Wowra B, Stief C, et al. Safety and feasibility of image-guided robotic radiosurgery for patients with limited bone metastases of prostate cancer. Urol Oncol 2013; 31: 455–60.